The 2018 Minnesota state legislative session begins February 20 and must end by May 21. A local coalition has virtually put the lawmakers on the clock by “serving notice” to them to seriously address systemic poverty and other disparities in this year’s session. Many believe the first Poor People’s Campaign in 1967 didn’t achieve its desired results largely due to King’s assassination in 1968. In December, the national progressive think tank Institute for Policy Studies released their preliminary report, The Souls of Poor Folk, finding that conditions today in this country aren’t that much different than in1968. According to the report, the U.S. overall poverty rate is at the same level today (12.7 percent) as it was 50 years ago. At least 15 million more people in America are poor because the country’s population has increased by over 123 million people since 1968. The report also shows that in 2016, Whites made up the largest share of the poor population (17.3 million) with Blacks (9.2 million), and Latinos (11.1 million) second and third, respectively. Thirty percent of the U.S. population — more than 95 million Americans — is either in poverty or considered “low income” (twice below the poverty line). Other report findings include that the U.S. child poverty rate has risen from 15.6 percent in 1968 to 18 percent in 2016. Nearly 31 percent (3.4 million) of Black children are in poverty compared to about 27 percent of Latino children (4.9 million). Female-headed households in 2016 were five and a half times more likely to be in poverty than married heads-of-households. According to recent state data, 37 percent of Blacks, 36 percent of Native Americans, 24 percent of Latinos and nine percent of Whites live in poverty. In the two Twin Cities metro counties, 13 percent of Hennepin County residents and 17 percent of Ramsey County residents live in poverty. “Poverty has no bias. 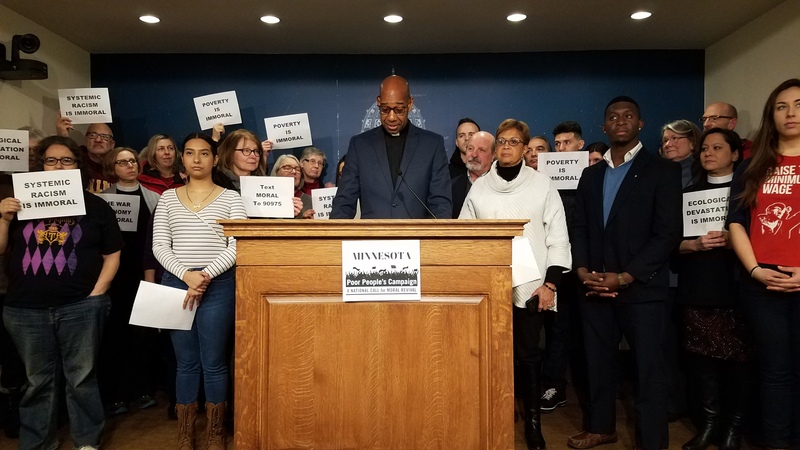 Everyone is affected by poverty, maybe not directly, but everyone knows someone,” said D’Narius Lewis, an activist with the Minnesota 15 Now campaign. His organization, which is advocating for a $15-an-hour minimum wage in St. Paul, is one of many groups that the Minnesota Poor People’s Campaign seeks to enlist, noted Minnesota Co-Chair DeWayne Davis. The MSR contacted several of the participants in person or by phone. Mary Kay Boyd and Rob Eller-Issacs are both involved in this year’s Poor People’s Campaign. They participated in the 1968 campaign as well. “When I got the call [I said] of course, I’ll come,” admitted Boyd, a veteran St. Paul education and human services professional. This year’s campaign fits with the work she and others are currently doing to help eradicate poverty and other disparities locally and nationally, she stressed. Davis, the senior pastor of All God’s Children Metropolitan Community Church, stressed, “It is about a real grassroots effort. The Poor People’s Campaign really needs to be led by the very people who are impacted — the very people who are poor. They should be the leaders,” he said. Barber, Theoharis and others pledge a “massive wave of nonviolent civil disobedience” around the country between now and May to call attention to the nation’s poverty problem. Davis told the MSR that the Minnesota delegation made a similar pledge last week for “a sustained massive effort at the State Capitol” in St. Paul. “There will be some surprises,” he promised. “Forty days of civil disobedience — I’m not sure how that will look,” said Boyd. Davis wants local and statewide organizations and groups already working for change to join the Minnesota Poor People’s Campaign. “We are about getting all the organizations, activists and clergy working on this issue to come together” in this effort. Hello, when will you meet next? I would desire to belong here. I really fear that we never reach. America does not want us. I’m convinced. Only our labor. When that is gone, we are nothing.